The Dales of Wensleydale and Swaledale were always very scenic and attractive, but have become renowned as a result of the popular television series, based on the books by James Herriot, “All Creatures Great and Small”, and which were about his work and exploits located in these two dales. The Herriot Way is a circular, unofficial route of 52 miles in length, in four stages of approximately 13 miles. The Herriot Way is a circular, unofficial route of 52 miles (84km) in length, in four stages of approximately 13 miles. The overall height gain is 7700 feet (2350m). The dales of Wensleydale and Swaledale were always very scenic and attractive, but have become renowned as a result of the popular television series, based on the books by James Herriot, “All Creatures Great and Small”, and which were about his work and exploits located in these two dales. The route starts at Aysgarth with its famous waterfalls. From here you will walk west following the River Ure, through wide meadows and following a disused railway track until turning into Askrigg. From Askrigg the route travels up the Wensleydale Valley to Hardraw Force, Englands highest single-drop waterfall and then into the market town of Hawes. From Hawes the path climbs up the side of Great Shunner Fell, following the Pennine Way and descends into Thwaite, and via the tiny hamlet of Keld. On leaving Keld the path climbs onto Gunnerside Moor, following old lead mining tracks, returning to the valley and the River Swale, and eastwards onto Reeth. The last day of the walk takes you over Grinton Moor and down into the village of Castle Bolton, with the remains of its historic castle, eventually arriving back into the village of Aysgarth. The hardest section of the walk is the day which includes Great Shunner Fell, which entails a long steady climb, not steep, and the path is generally good and paved for long sections. Myself and my friend recently completed the Herriot Way and found the baggage transport service provided by Brigantes to be excellent; It greatly contributed to what was an enjoyable walk. Furthermore, the company were very easy to deal with at the booking stage. We would certainly avail of their services again. Just completed the Herriot Way in four days’ of unexpected, brilliant sunshine! Just beautiful. We booked the B&B’s ourselves, used the .pdf of Stuart Grieg’s book for the walk and Brigantes to transfer our luggage. 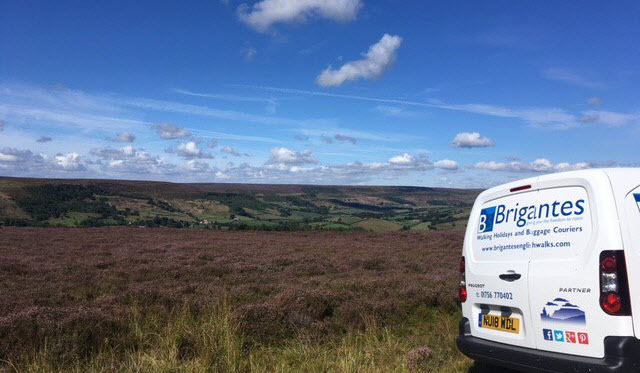 The service from Brigantes was so easy and hassle-free and our bags were always there waiting for us when we arrived – we would highly recommend them. We absolutely loved walking The Heriot Way last weekend in the sunshine. The Dales is always beautiful but particularly so in the sunshine with the daffodils blooming. Thank you to Brigantes for an excellent service, the B&B’s were great and the baggage service worked really well. There are so many routes to choose from so I think we will be calling on your services again. Many thanks for your excellent service transporting our bags whilst we were walking the Herriot Way last week. Our bags were always delivered where & when we expected them by your drivers. We chose Brigantes because of the very friendly service & prompt replies when making our booking. We will definitely use them again without hesitation when we walk Hadrian’s Wall next year!